The remit of this site allows me to write about many of my great interests, but I might not have expected American railroads to be among them! The flow of locomotives across the North Atlantic has always been much more from America to Europe than vice versa. However the 1970s did see two particular European locomotives make a brief sojourn to the USA (and I’m not talking about “Flying Scotsman”!). The 100mph streamlined Art Deco 2-Co-Co-2 “GG1” electric locos built for the Pennsylvania Railroad in the 1930s were, by all accounts, highly impressive machines, but by the time of the creation of Amtrak on 1st May 1971, they were showing their age. Consequently, the nascent organisation quickly sought to replace them with new traction. At the time, there was nothing appropriate “off the shelf” in the States, but procurement of a suitable fleet from Europe would have taken years. Amtrak therefore looked to General Electric to rapidly develop an express (120mph) passenger version of its brutal-looking “E60” locos – 6,000hp machines under construction at that time for heavy freight work on the Black Mesa and Lake Powell Railroad. The initial E60 order was placed by Amtrak in early 1973. Amtrak therefore selected two modern electric locomotive designs from Europe to test on its famed Northeast Corridor: one from Sweden (which they numbered X995) and one from France (X996). These plans were formalised in October 1975 with both locos to arrive roughly a year later. The first to arrive, in August 1976, was brand-new SJ Rc4 electric loco, Rc4 1166, built by Allmänna Svenska Elektriska Aktiebolaget (ASEA). This was painted in Amtrak livery and numbered X995. Until April 1977, it was tested on the Northeast Corridor between New York and Washington DC at up to 200km/h. Upon return to Sweden, it was painted into SJ’s red livery and entered service. As a reminder of its early travels, it obtained a cabside plaque (photo here), although this is understood to have been stolen. Rc4 1166 remains in service to this day with Green Cargo (see photo here). By comparison, although the nominated French machine was relatively new, it was not fresh off the production line. CC21003 was one of a fleet of four dual-voltage machines built to the classic Paul Arzens “nez cassé” (“broken nose”) design; it had entered service with SNCF in June 1974. During 1976, the loco was lent back from SNCF to its builders – Alsthom, in Belfort – from where it was turned into an American demonstrator (no mean feat considering the significant modifications involved – not least a new transformer for the different voltage of 11kV a.c. used over there). CC21003 – by now X996 – was ready by the end of the year and was shipped to the States from Le Havre in January 1977 (see photo here). X996 was put to work being tested under the same conditions as the Swedish machine. However, these tests were not as successful. 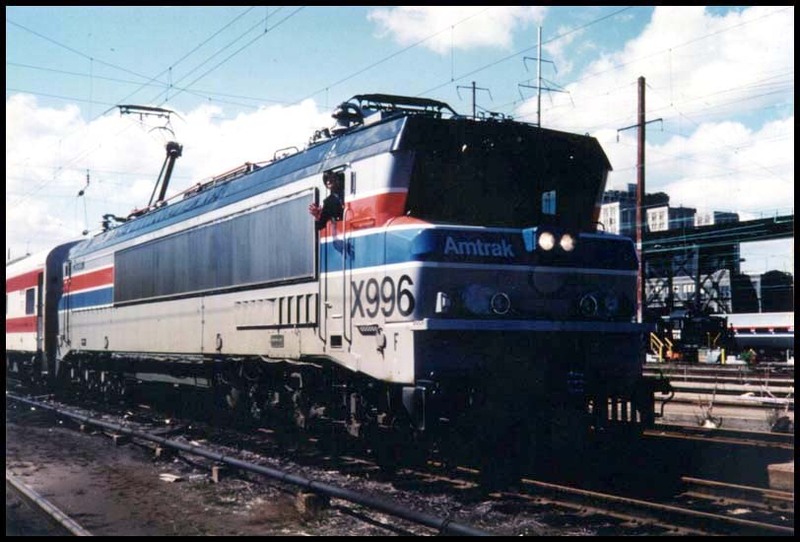 Following the debacle with the E60s, Amtrak were understandably tetchy about locomotive suspension, ride quality and wheelsets, and X996 did not shape up in this respect. The Americans concluded that the loco’s design did not pass muster for their needs; the French maintained that the loco was fine but the condition of the track was the issue. The loco was only used in anger over there for a month, between March and April 1977; the testing was then terminated and the loco was returned to Belfort in the June. It was promptly converted back to the dual-voltage loco it had been when SNCF had returned it there in 1976. CC21003 returned to French metals. In the mid-1990s, along with its three sisters, it lost its a.c. capability and was reclassified accordingly as a CC6500; it became CC6577. It was withdrawn in 2005 and then quietly scrapped. Predictably, given the issues identified with X996, the lightweight Swedish machine won out with the Americans – and indeed an order for a fleet was forthcoming. These were manufactured under licence by General Motors’s Electro-Motive Division (EMD) in La Grange, Illinois, with bodyshells from Budd and bogies and electricals from Sweden. 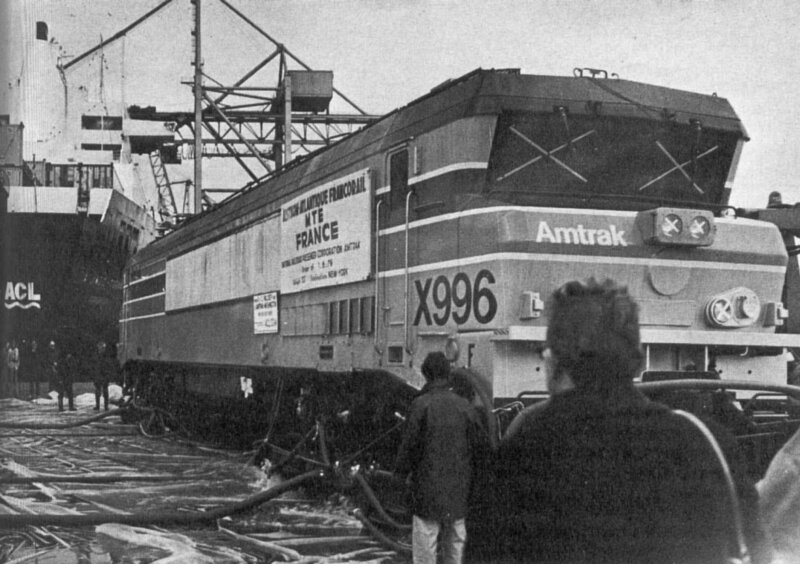 This fleet, which was delivered to Amtrak from 1980, was designated AEM-7 (ASEA Electro-Motive – 7,000 hp) and eventually numbered 54 machines. Commuter rail operators MARC and SEPTA also purchased small fleets. Amtrak’s AEM-7s gave sterling service up until the withdrawal of their last examples in Summer 2016. MARC’s followed suit in 2017 and SEPTA’s examples are expected to be gone by the end of this year; ending over four decades of Rc4 technology on American metals. Sunday 17th June 2018 sees an attractive little railtour featuring the first main line passenger run of an iconic class of locomotive in over a decade. SNCF CC40100 class loco CC40110 will be making its first passenger train appearance in years on Sunday 17th June 2018, when it hauls a railtour on an 160-mile round trip from Paris Gare du Nord to Amiens and return. The railtour is being operated by Matériel Ferroviaire, Patrimoine National (MFPN – in English, “Rolling Stock, National Heritage”, a name which I think sums up the ideals of railway preservation nicely) who also own the loco. I must say that I have found the organisers to be immensely polite and helpful, and although my dealings with them to date have been in French, they assure me that they have members who speak English should you require dialogue. I also have a PDF booking form for the tour, so if you would like a copy of this to fire off to them, please just contact me and I will email it across (this is not yet on their website). CC40110 is one of three surviving members of this once ten-strong class (technically there were eleven, as the original CC40106 was written off very early in its life in 1969 and was replaced by a new loco with the same number) – and the only one that is operational. These were instantly-recognisable, visually striking (built to Paul Arzens’ “Nez Cassé” design), powerful four-voltage machines built to haul the “Trans-Europe Express” (TEE) across borders. However, in practice, they only worked to Belgium (both Brussel and Liège). They were withdrawn in the mid-1990s with the onset of the “Thalys” concept, which can be considered a modern-day successor to the “PBA” (Paris-Brussel-Amsterdam) axis of the TEE. According to indicative timings, the train will depart from Paris Gare du Nord at 07:25, arriving in Amiens at approximately 09:30. Participants then have over seven hours to explore the city, before returning at 16:35 and arriving back at the blocks at roughly 18:35. Obviously for an 07:25 departure from Paris, you will need to have stayed in or around the French capital on the Saturday night, as there are no overnight trains that arrive early enough to reliably get you there from elsewhere. Perhaps my Paris in a day article from May 2017 might give you some ideas about seeking out loco haulage in the local area – although, sadly, there will no longer be any diesel diagrams around the capital by the time this train runs. 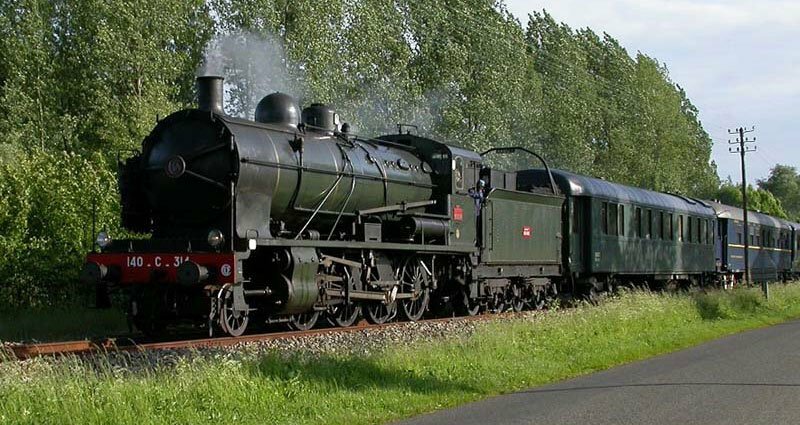 The return fare for this excursion is only €49 standard class (€74 first class). The most obvious activity for enthusiasts in the seven-hour layover at Amiens is to have a look at the BB67400 diesels on the route from there to Boulogne (see brief trip report from 2014 that included covering these turns here). It is possible to make a round trip to Boulogne on one of these (IC2011 10:51 Amiens – Boulogne Ville 12:26 / IC2026 14:45 Boulogne Ville – Amiens 16:09 – but watch out for that estimated +26 onto the tour) but not a lot of other tunes that you can play on that, to be honest. As you would expect, this tour would also be an ideal one on which to take the family. The whole point of its running is to visit Amiens (tourist website here) on this particular day – the third Sunday of June each year sees “le marché sur l’eau” (“the market on the water”) where market gardeners in traditional dress go along the River Somme in cone-shaped boats, before setting up at the waterside and selling their fruit, vegetables and flowers. If this does not particularly appeal to you, Amiens itself is a historic city in its own right – and its history is not restricted to that indelibly linked to 20th century wars, although both have left their mark still visible today – and there are guided historical tours offered as an optional extra when you book your railtour ticket. The city’s imposing Gothic cathedral is a UNESCO World Heritage Site. Across Europe there are a number of locomotives now to be found in quite surprising places; ones you may not “stumble upon” unless you know where to look. One example that springs quickly to mind in this respect is French centre cab electric loco CC14161. 102 locos of the CC14100 class entered traffic with the SNCF between 1954 and 1957. One of a number of similar classes built by a variety of different companies and nicknamed “fers à repasser” (“flat irons”), these machines were synonymous with the Grand Est region of France, and particularly Thionville depot, for their entire career. These were powerful, low-geared machines ideal for the abundance of heavy freight traffic that existed in the area in their day – from the Lorraine coalfields, or the steelworks of Luxembourg, and so on. Above is a link to a YouTube video uploaded by user Maurice Testu showing a CC14100 engaged in some shunting operations at Lille-Délivrance marshalling yard in 1989. The destruction of the French coal mining industry, and the wide-ranging social problems it caused, are well documented elsewhere. Suffice to say, the late 1980s and early 1990s saw the process of closing all of the country’s mines gather speed (the last one closed in 2004), and France’s industrial focus naturally shifted. Combine this with the collapse of much of Luxembourg’s steel production in the mid-to-late 1970s (prior to this, the tiny Grand Duchy had been the world’s 9th biggest producer of steel) and these aging locos rapidly lost much of their raison d’être. The last of the CC14100s was out of traffic by 1997. The negative impacts of the loss of north-east France’s coal mines will be felt for at least a generation. However, efforts have been made to commemorate this in a more positive manner, too, and as a part of the bigger picture involved, this has involved CC14100s. Of the 102 machines, just 2 are thought to remain. One, CC14183, along with BB12083 was intended from 1998 as an exhibit of the mining museum at Petite-Roselle, however it is reported to have suffered badly from unprotected outdoor storage. The last I heard, in early 2015, both were for sale – but with the buyer needing to arrange their transport, scrapping was a real prospect at the time. Disturbingly, there is no longer any reference to either on the museum’s website, and I am not aware of them having moved on – please do contact me if you’re able to provide an update on them! The other surviving CC14100 is just as “under the radar”, but is at least cared for and is on public view – even if it does seem unlikely that it will ever draw power from overheads again. CC14161 also has a role as a memorial to the mining industry of the area. After withdrawal in 1994, SNCF offered it to the town of Conflans-en-Jarnisy, approximately 20 miles west of Metz, as a static exhibit. The view of CC 14161 in its current resting place, as per Google Maps! You can find it here – about half an hour’s walk from Conflans-Jarny station, about half way between Nancy and Longwy. Similar loco BB12114 is also owned by the town, but is currently under restoration at a private location near the station, and is likely to join CC14161 at some point in the future – at which point hopefully some covered accommodation will hopefully have been arranged for these important machines. Among the most popular French locomotive types are the class CC6500 express electrics. Retired from main line use for over a decade, there are currently two in working order, and Saturday 9th December 2017 sees both in use on the same day. This class of 200km/h 1.5kV dc electrics were the crack express locos of their day in pre-TGV France, and are one of several types built to Paul Arzens’s classic “broken nose” styling. 74 were built – with a further 4 converted in the 1990s from CC21000 class locos (one of which, CC21003, had been tested between Washington DC and New York by Amtrak in 1977) – but only 2 remain in occasional service on the main line; CC6558 and CC6570. 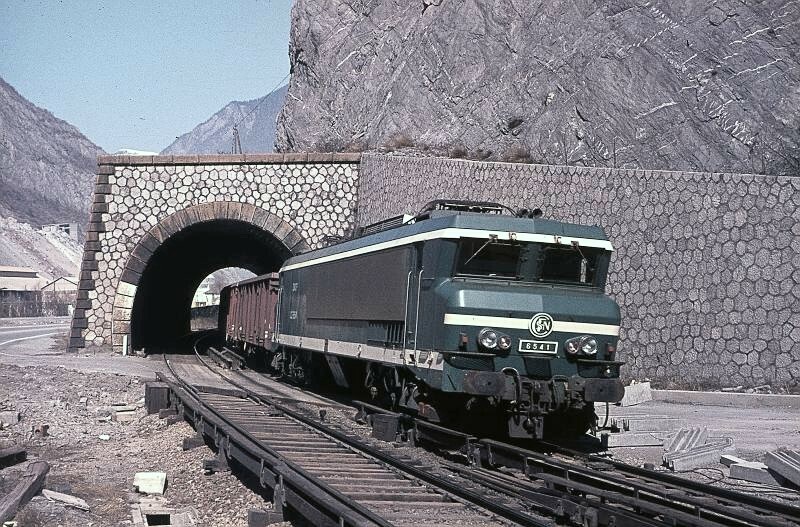 CC6558 is painted in green livery, and is notable as one of the 21 machines that were actually built as dual voltage, to also operate on the 1.5kV dc third rail system on the Maurienne route from Chambéry to Modane, which was converted to overheads in 1976. It is perhaps a little odd to see photos of these machines hauling trains with no catenary in sight! CC6570, meanwhile, is painted in the attractive burgundy and orange “coup de soleil” (sunburn) livery. CC6558 is working a short-but-sweet railtour from Chambéry (where it is based) to Lyon and return, in connection with the Festival of Lights and the Christmas market there. Lyon is France’s second-biggest city and is a UNESCO World Heritage site so is surely worth a visit! The tour departs Chambéry at 13:59 and returns from Lyon Perrache at 23:40, with a journey time in each direction of appoximately two hours. The fare for the round trip is a bargain €23. The tour is operated by the APMFS (l’Association pour la Préservation du Matériel Ferroviaire Savoyard) and more details can be found on their site here. The above is a link to a YouTube video by user Paul Mollard showing CC6558 on the same working five years ago. CC6570’s duty is from Avignon-Centre to Arles and return and is essentially a Santa Special, with treats and entertainments for children on board. The route is circular, travelling out via Cavaillon, Salon and Miramas, and back via Tarascon, and the train performs this loop twice – at 15:00 and 17:00 from Avignon. The second of these can even be easily reached from the 07:52 Eurostar from London to Paris that morning. The fare for a round trip is a supremely reasonable €12, and there is an option to travel outwards on the first, have a break of two hours in Arles, then return on the second. This tour is operated by APCC6570, and more details can be found on their site here. Update 25/11/17: this tour is now fully booked. The above is a link to a YouTube video by appropriately-named user Nez Cassés showing CC6570 on the main line in 2016. Whilst the clash is perhaps unfortunate in some respects, you may be interested to know that you can comfortably travel behind both during the day – and given the very cheap prices involved, missing part of a tour is not necessarily the end of the world. Following the arrival of the second round trip from Avignon to Arles with CC6570 (departs approx 17:00 and returns approx 19:00), you can travel on the 20:27 local train to Avignon TGV, a TGV to Lyon Part-Dieu, and then another local train into Lyon Perrache, arriving at 22:43 and giving you a nice +57 onto CC6558’s return working (of course, what you then do at 01:42 at Chambéry is up to you!). An advance through ticket from Avignon-Centre to Lyon Perrache on these service trains is currently available on the SNCF website (at the time of writing) at €14.50, meaning that the entire itinerary including both CC6500s and transport between them is theoretically available for less than €50. This relatively unremarkable photo of BB15024 on the blocks at Paris Gare du Nord was taken 10 years ago this week – Saturday 2nd September 2007. What makes it noteworthy is that I didn’t intend to be there. In fact, I didn’t even intend to be in France. This train was the Hamburg-Paris overnight, which after five consecutive overnights mainly chasing 218s in Germany, I was using as my taxi from Hamburg to Brussels, for my pre-booked Eurostar back to Waterloo, home for a de-rance and then a ticket for Aston Villa v Chelsea… What could go wrong? …I woke up to the sound of a loud “clunk”. My book was was on the floor, broad daylight illuminated the compartment and the word “Quévy” was sitting outside the window… Bowled!! The clunk had been the shackle as 2705 was removed at the Belgian/French border – I’d slept completely through Brussels and out the other side. Not stopped at a platform, I was unable to get off, and was then trapped seething on board the train as BB15024 backed on, to take us non-stop the last 150-odd miles to the French capital. My move was in tatters and it was only through the booking office staff taking pity on such gormlessness that I got home via Eurostar with minimal issues. I missed the Villa win 2-0 though! In retrospect, it saddens me most that such traction variety that we took entirely for granted is now a thing of the past. In one seat, over the course of only a few hours, I was powered by 7 different locos – from modern high speed electrics, to elderly post-war machines, to 4000hp freight diesels, to shunters. Even some of the route that my overnight traversed is no longer used by passenger trains. 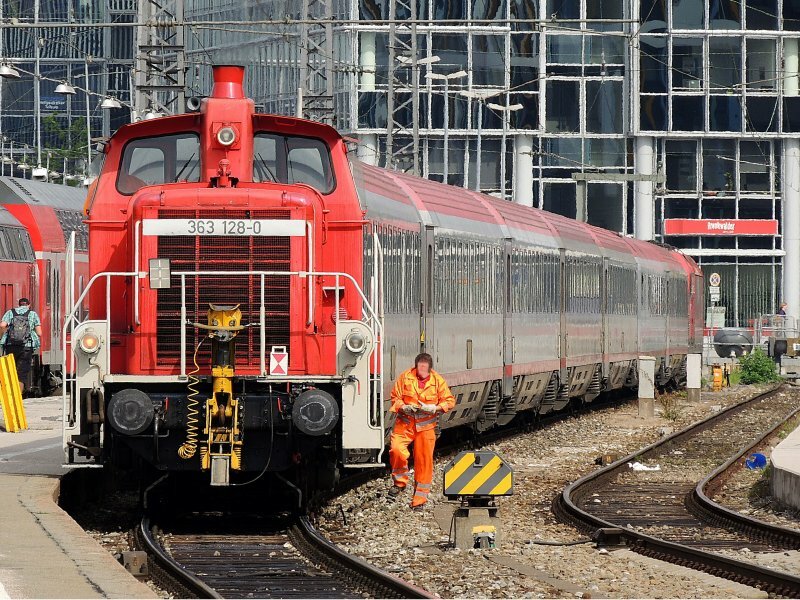 Banking and shunting locos remarshalling passenger trains are virtually unheard-of in Western Europe these days.